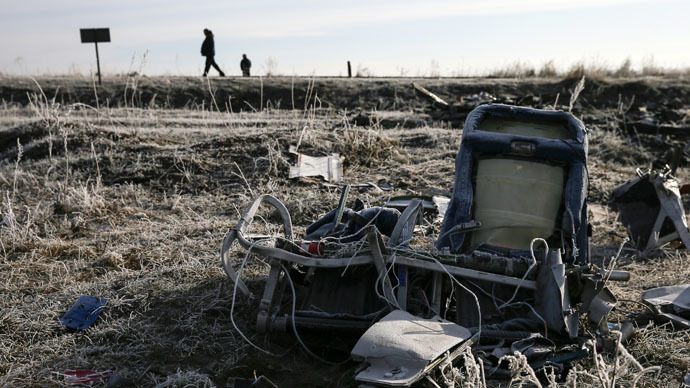 There is so much political pressure over the MH17 crash in Ukraine that investigators would rather conclude that no one really knows what happened than make several powerful people look foolish, believes Robert Parry, editor of Consortium News. More than eight months since Malaysia Airlines flight MH17 was shot down above war-torn eastern Ukraine, speculation in international media is only adding fuel to the blame game, while no actual evidence to back claims has been released. The US intelligence community is failing to share its own discoveries into the crash, fearing it will lead the investigation in the "wrong" direction, Robert Parry told RT. RT:Are there any facts behind this suggestion that there could be some information that we’re not being told from American intelligence about what happened to MH17? Robert Parry: As you remember the plane was shot down on July 17 of last year. There was an immediate rush to judgment in the US and elsewhere blaming the Russians and the pro-Russian rebels. That is what people were saying literally within days of the incident. And on that Sunday, the plane was shot down on Thursday and by that Sunday, Secretary of State John Kerry went on all five American Sunday TV shows and essentially made that argument saying he had strong circumstantial evidence. Then on July 22, the director of National Intelligence issued a white paper based largely on social media and some scattered intelligence that was then available also pointing the finger in the same direction, towards the rebels and towards the Russian government that is supposedly supplying sophisticated BUK missile system to the rebels. Now very quickly along that period I was being told from a source who has been briefed by some of the US intelligence analysts that their actual evidence was going in a very different direction. That they have not seen evidence that the Russian government had provided the BUK missile system. They had still been trying to figure out who had fired it. And clearly the US intelligence community continued to work [on]the issue. They’ve gone for weeks going back to the material – both electronic and other intelligence material, as well as satellite photos – to see what they can determine. Now just recently this past month Assistant Secretary of State Victoria Nuland testified before Congress and again pointed the finger at the Russians and the ethnic Russian rebels. So I tried to contact the State Department at that point to see if they had any new information to back up their claim. I got no response from them. So I went to the Central Intelligence Agency. And I’ve received from them a suggestion that I go to the Director of the National Intelligence (DNI), which I did. And they actually responded. But their response was to send me the July 22 White Paper that they had put out almost eight months before. RT:So you are basically getting the run-around on any kind of information here. Do you think this is normal or does it lead you to believe that this investigation is taking a bit too long? I mean in the crash that we saw last weeks in the Alps, it certainly is an ongoing investigation, but light, serious light was shone on that case within 48 hours. Is it normal for an investigation like this done by the Europeans to take so long? RP: No it is not. And clearly the US intelligence community knows a great deal more at this point than they did on July 22. And I responded to the DNI saying, “this is not a credible response here.” Because I know from my sourcing that there has been advancement, refinement, into what the US government knows. But they were just sticking to their position. So there has obviously been a case where the US government and many of the other governments involved in this know a great deal more than they did within those few days after the event. But they are not willing to share that with the public. RT:Why do you think we are seeing so many accusations from the European press? Just today, we have an unverified video apparently from Ukraine in the Dutch press about this case, making the case that this was in fact the rebels. Why so much the opposite of the sort of details that you're implying or at least trying to delve into from the State Department? RP: Well, I can't comment at what some others may be looking at. What I was told by this source who has been briefed by a US intelligence analyst was that the information was going in a very different direction. That they were looking more into some rogue operation implicating some element of the Ukrainian military. But we still don’t know. The BND in Germany, their intelligence service, according to Der Spiegel, said the rebels fired the missiles but said that the missile did not come from Russia, it came from a captured battery of the Ukrainian military. So there is conflicting information out there. But frankly there is really no reason eight months into this investigation that so much is being kept from the world public. RT:Do you think the truth will eventually come out on MH17? RP: I don’t know. I think there is there is such an amount of political pressure on this one. It will be very embarrassing if the investigation goes off in the direction that makes many powerful people look foolish. So I think there will be a lot of intense effort to either pretend that no one really knows for sure or some other possible answer but it maybe that this will get lost because once a cold case becomes this cold, once the people who have perpetrated this have this much time to escape and to hide, it makes it much harder to ultimately get to the bottom of this.